Seminar “Environmental sustainability at school”. IPS Federico II Enna. On Monday 17th December we started our activities for the Ecoaudit campaign with a seminar. 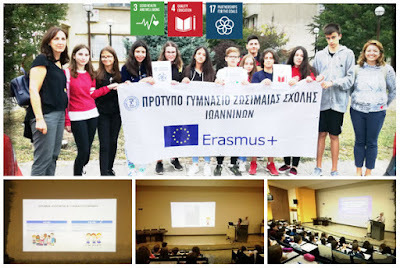 She focused the students' attention on the concept of Sustainable Development and on some goals of Agenda 2030, Goal 12 "Responsible Consumption and Production", Goal 11 " Sustainable Cities and Communities" and Goal 13 "Climate actions". The expert invited the students to engage themselves in recycling, reducing their consumption of water, electricity and gas and using sustainable means of transport. As part of our Christmas Activities our student have organized a “Solidarity Day”, including different workshops about how to find and reduce inequalities, a talk followed by a discussion about inequalities, a flea market to raise money for ONG's and sport activities. Congratulations to all the students that have participated and made possible the Solidarity Day. 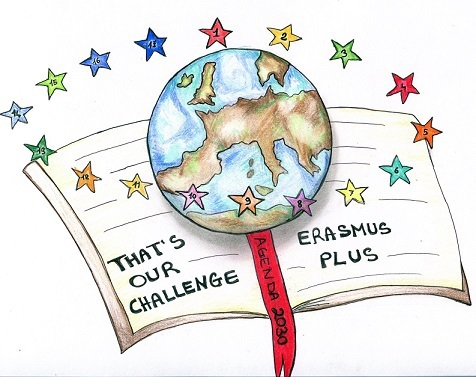 There are "17 reasons why..." we celebrate our actions to improve the world! 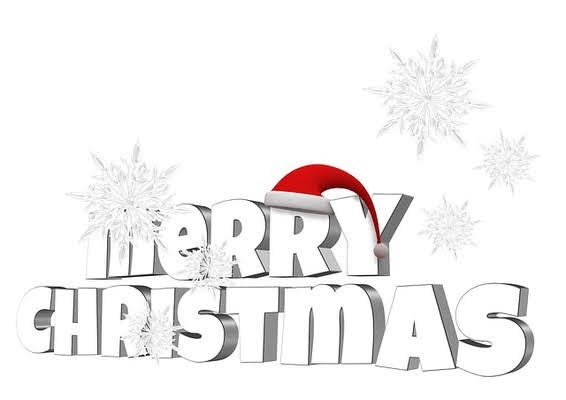 There is one common goal: to share the gift of love and peace with everyone not only during the Holy Season of Christmas but every day in our lives! Prosperous New Year to all of you! In the spirit of Christmas, our students collected eco-friendly recyclable materials to decorate our Agenda Christmas tree. 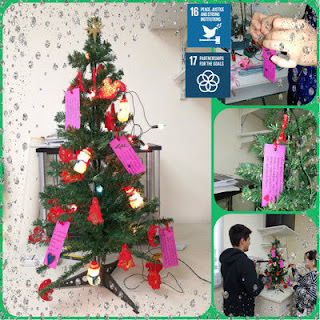 At the same time, they created slogans, wrote them down and painted cards devoted to Peace All Over the World, which is the important meaning of Christmas, to put on it. The 17 Goals and, especially Goal 16: Peace, Justice and Strong Institutions, were this way celebrated and made a good impression to everyone in our school. that the goals of the 2030 agenda be achieved. On 3rd December, the International Day of Persons with Disabilities, we took a voluntary initiative for the organized development of a plastic cap collection network. The purpose of the action is to develop and activate recycling consciousness, voluntary spirit and social awareness, for the benefit of children with disabilities and financial assistance for the purchase of technical infrastructure of the local institution “MERIMNA”. 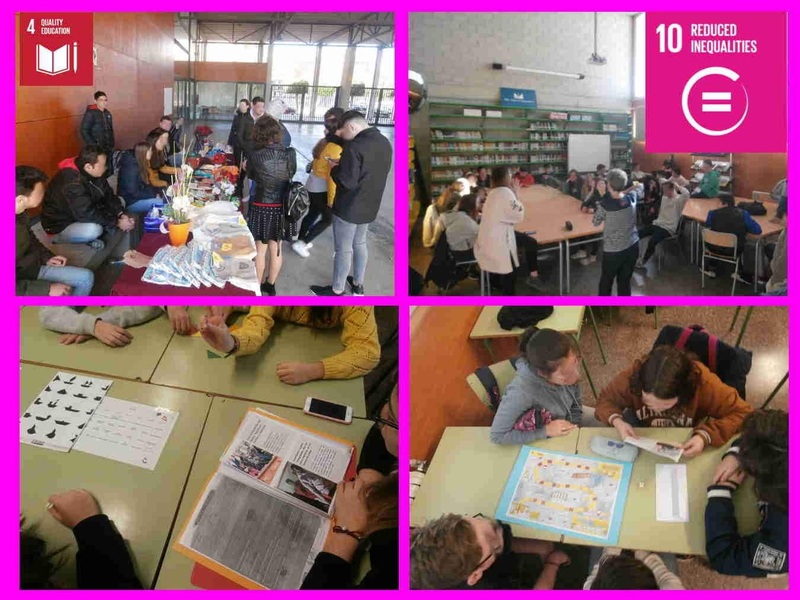 We handed out a lot of plastic caps that had been collected since the beginning of the school year for this social purpose, since we had understood the principles, values ​​and importance of respecting the diversity of people with disabilities, as well as the equal rights they deserve. 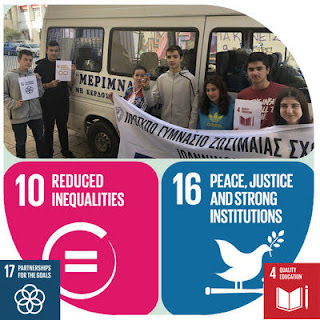 This way, we served Goal 10: Reduced Inequalities, Goal 16: Peace, Justice and Strong Institutions, Goal 17: Partnerships for the Goals and Goal 4: Quality Education. We celebrated the World Cleanup Day (15th September), a day when over 100 countries and millions of volunteers unite for one goal: to take the first step towards trash free world. 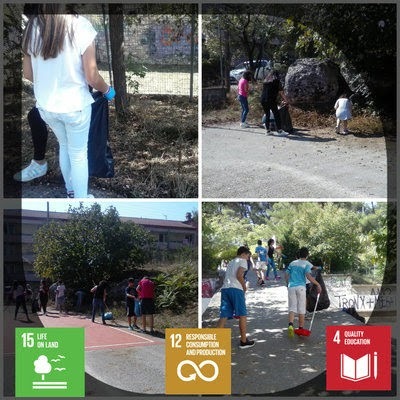 As part of this civil movement to make world a cleaner place, our school took part in this year's “Let's Do It, Greece” campaign cleaning the school courtyard. Thus, on Friday, September 14, students cleared their own space, giving their own environmental message to reduce the garbage in the natural environment so close or far away from us. 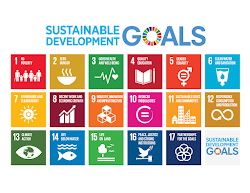 So, we served Goal 15: Life on Land, Goal 12: Responsible Consumption and Production and Goal 4: Quality Education. 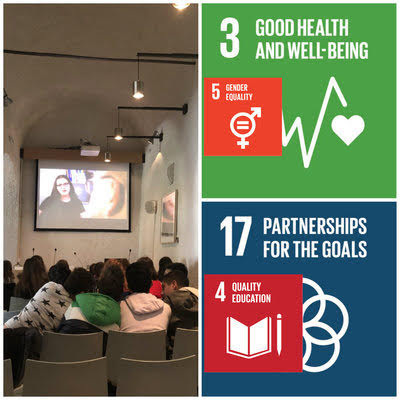 As teenagers our students attended the documentary "Science for Adolescence" in the Piraeus Bank Institute, a fact that gave them the opportunity to engage in an interactive and fruitful discussion and to rearrange their teenage priorities. This way they learned that every gender difference is mainly based on biological background and must be accepted. 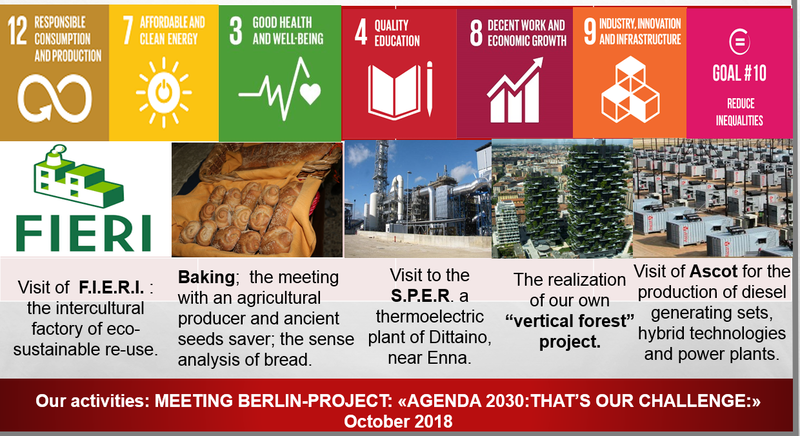 So, we enthusiastically served Goal 3: Good Health and Well-Being, Goal 5: Gender Equality, Goal 4: Quality Education and Goal 17: Partnerships for the Goals. The Erasmus students took part in an educational action of the Silversmithing Museum, concerning the multicultural history of our city, since people who live together create a common civilization. 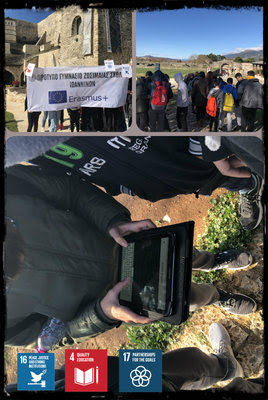 Through a digital application and using tablets, our students searched for information hidden in the museums and monuments of the archaeological site of "Itch Kale” and revealed hidden myths and stories of the communities that co-existed for years. The action served Goal 16: Peace, Justice and Strong Institutions, as well as Goal 4: Quality Education and Goal 17: Partnerships for the Goals. In the beginning of November, we had the honor of attending an interesting seminar organized by the Professor of the Pathological Clinic at the University Hospital of Ioannina,concerning the subject “Health in the Teen Age”. The purpose of the seminar was to educate students to better prevent and respond to possible physical and social risks that they may encounter both in school and in society. As we know, good health is a prerequisite for the development and progress of a society, so we must ensure that we are healthy and well mature through the knowledge of the necessary prevention and health programs. With this seminar we served Goal 3: Good Health and Well-Being, Goal 17: Partnerships for the Goals and Goal 4: Quality Education. 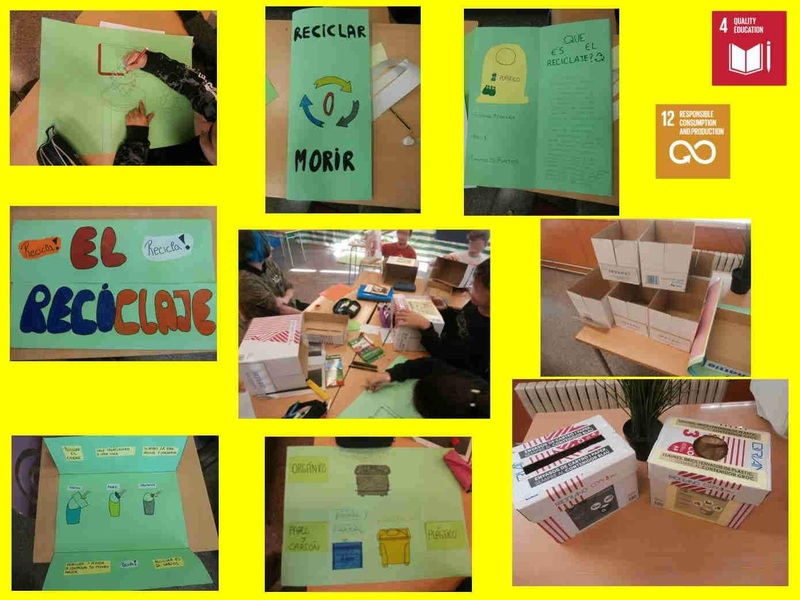 On the occasion of “The European Week for Waste Reduction” (EWWR) we are preparing our awareness campaign in order to improve the bad recycling results that we found in the eco-audit. Grade 9th and 10th students are doing leaflets, cardboards and waste bins for plastic and paper. They will explain to grade 7th and 8th students all the information about recycling and then place two new waste bins in the classrooms. As part of our Peer Mediation Program, we have presented a new action called «Tandem». Grade 9th students will help grade 7th students in order to create and maintain a happy and wealthy working environment where students feel secure and motivated to learn. First, our Headmistress presented the action to all the educational community. Then, students used puzzle pieces, showing bicycles, to find their partners to complete the “Tandem”. Finally, the teams did activities to create confidence between them. We must offer a quality education to our pupils, creating and affective climate environment where students can cooperate, collaborate, help and respect each other. 25 November, International Day for the Elimination of Violence against Women. 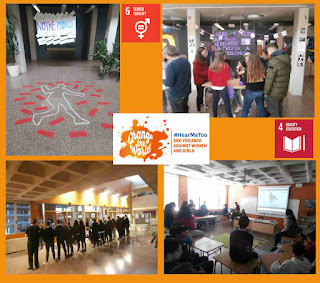 Our students have organised workshops, exhibitions and a performance to make this violence visible and fight against it. The “ vertical forest” designed by Stefano Boeri architects’ studio is a design of urban reforestation. It aims at an interaction between domestic environment and nature, taking advantage of verticality while controlling urban growth. The forest, made up of two towers, houses thousands of trees and plants. Thanks to this variety of species , a microclimate is able to promote: birds and insect colonization, particles filtration, acoustic insulation. As regards water, there is a centralized system of drip irrigation. 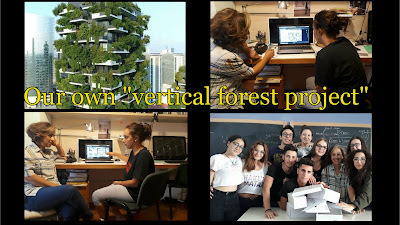 Water comes from the building grey water or groundwater.Together with the teacher Mrs Pampallona, we are carrying out a very interesting project aiming at the realization of a “vertical forest”. We are collaborating with the external expert and young architect, Mrs Elena Bruno for the success of the initiative. The first pratical action has been the search for planimetries. 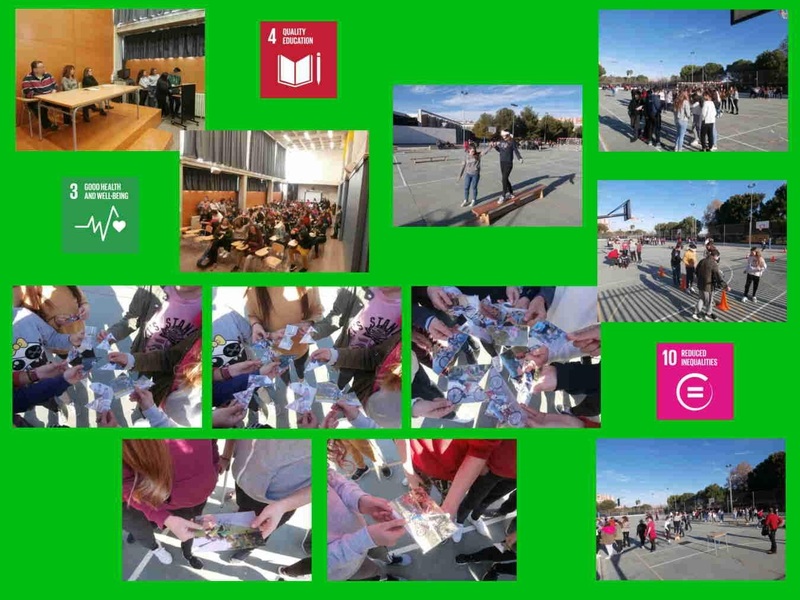 The second phase involved the students in getting waste materials useful to the fulfiment of the project.All along the school year we will carry out the next steps for the realization of our own “vertical forest” project.